We are pleased to announce the hiring of two new staff members, who are integral to our growing production team: Grant Hawley is our new production manager and Landon Quebedeaux is our new production specialist. Both bring years of experience and talent to the team! Learn more about these great guys here. In late-2016, Microsoft decided to do a small business makeover of Homegrown Trailers, providing hardware and software to help us run the business more effectively. This video in particular tells the story of Corey's switch from Google's Chromebook to Microsoft's Surface with some great footage of our operations. We recently turned to Microsoft and SADA Systems, a Microsoft National Solutions Provider, to digitally transform our company's technology profile. We vastly upgraded our hardware and software tools to be more effective at what we do best: building, selling, and renting travel trailers. Learn more here in a post written by our CEO on Microsoft's official Windows blog. The company triples its facility size, which allows us to manufacture more trailers, gain more showroom and rental operations space, and expand our public visibility. Our new location is at 511 6th Street S, Kirkland, WA 98033, just east of the city's downtown core and near iconic businesses like Google and local business like Chainline Brewing. Today, we officially bring on two talented employees, who had previously been working with us on a contract basis. Clem Romero (lead carpenter) and Taylor Senechal (production assistant) are integral to the construction of our handcrafted trailers and to the long-term success of the business. Welcome to the family! We have achieved a number of exciting milestones in our first year of business, including refining our product; securing certifications, licenses, and other regulatory requirements; manufacturing numerous trailers for sale; renting dozens more trailers; participating in a variety of events; earning coverage in countless media outlets; and growing a talented staff. We're really excited about a banner year in 2017! Homegrown Trailers welcomes two new employees, Katie Wecker and Kelli Taylor! Katie is our Customer and Product Coordinator who is the critical bridge between the production and sales teams, ensuring that customers get the exact trailers they want and on time. Kelli is our Outreach and Rental Coordinator, a talented marketing and sales professional who cultivates customer relationships and manages our rental program. We've listened to what our customers want and have developed a list of aesthetic and feature preferences for purchase units. Add more solar panels and batteries, pick your favor exterior and interior colors, add a hot water tank or outdoor shower, get natural organic mattresses, and much more. Visit our Sales page to review all your options. After months of preparation and production, we are officially starting our rental program. Customers book on our Rentals page and then come to our Woodinville office to pick-up and drop-off their trailers. We provide a beautiful trailer complete with a full battery charge, a full tank of fresh water, clean bedding, and a full set of eating and cooking utensils and equipment. You just need to arrive with clothes, food, and your sense of adventure! 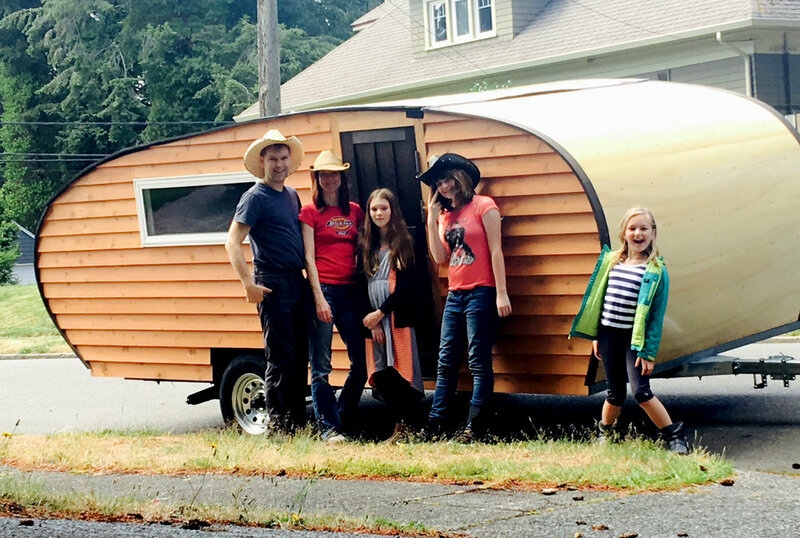 Washington State Labor and Industries (L&I) has approved Homegrown Trailers' design and construction, which makes them officially sanctioned recreational vehicles. In addition to being sustainable and attractive, our trailers have been independently determined to be safe and secure. We're so proud! We are excited to announce that months of planning, innovation, and production have led to the release of our new trailer. These beauties maintain all the sustainable materials and highly desired features and add even more handcrafted finishes and new features such as more solar panels, advanced lithium-ion batteries, a back hatch, fold-away bunk beds, a dutch door, opening side windows, and more! Customers can now purchase or rent trailers on our website through an easy and secure platform. Go to our Sales page to either pay-in-full or make a deposit to reserve your place in line. Go to our Rental page to book a rental with a user-friendly scheduling tool that will allow you to reserve your summer trips in just a couple minutes. The company is now actively producing its fleet of trailers from Woodinville, WA. We are including a number of exciting new features that will not only make our trailers the most sustainable in the world, but also the most comfortable and fun! Rentals and purchases are available now on this website. The company hits a big milestone by moving into an ideal space in Woodinville, WA that will serve as its production facility, corporate offices, and rental and purchase center. Homegrown Trailers is excited to be a part of the thriving business community there as it looks to become the newest iconic company in the city. After months of business preparation and fine-tuning our prototype, Homegrown Trailers official incorporates with the State of Washington. We are launching to create the most sustainable, beautiful, and comfortable travel trailers on the market today that will reconnect people to nature and adventure! "A Teardrop with a Conscience"
"Charming wood teardrop trailer is perfect for off-grid eco adventures"
"These handcrafted Homegrown Trailers are turning people into happy campers"
"PJ's Picks - Recreation Vehicle Reviews"
"Sustainable trailers have many uses"
"Timber-Clad Teardrop Trailer Chases the Sun"
For more articles, search for "Homegrown Trailers" in Google News.